French Emblems: Emblem: Amour oste sens & raison. Amour oste sens & raison. Donnoit vigueur à l’effort de ses mains. Qui suyt d’amour la perilleuse flame. A son costé la quenoille & fuseau. Car s’il le fait vous serez malheureux. Vaincu d’amour: comment il est traicté. Pouvoir n’eust heu sa flesche envenimee. 1. 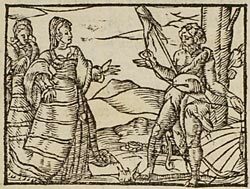 Iole: daughter of Eurytus, Prince of Oechalia, who received a bow from Apollo, and promised his daughter to whomever could beat his sons in archery. Hercules won, but Eurytus did not keep his promise, and Hercules killed him and his sons and took the girl as his wife. It is interesting to note that Hercules’ boy-toy is Hylas, which name could also be represented in French as Yolla.